Wayfarer™ is a vinyl-loop outdoor mat with a color-coordinated solid-sheet vinyl back. The vinyl-loop design removes dirt and moisture from shoes and securely traps them beneath the mat?s surface. 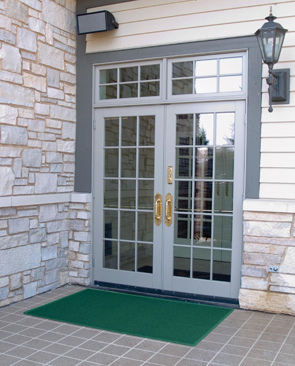 Wayfarer™ is specially designed to dry quickly and resist mildew making it the perfect mat for outdoor entrances, drinking fountains, and pool areas. Optional 1/8" thick beveled vinyl nosing for custom cuts gives entrance matting a factory finished appearance and reduces trip hazards by creating a gradual elevation for the mat edge. A vinyl-looped construction that traps dirt and moisture while scraping debris. 3/8" thick and features a thick vinyl backing to resist movement.